Welcome to a new month! February is the month of enrollment at Asto Wamah. Beginning on Friday the 1st, registrations come in and the season officially begins! We cannot wait! Because camp looks so different in the winter, I am sending 2 photos that will make the difference between summer and winter clearer. Both pictures were taken on January 28th from the Little Dipper Dock. The first is looking toward the Main Dock. 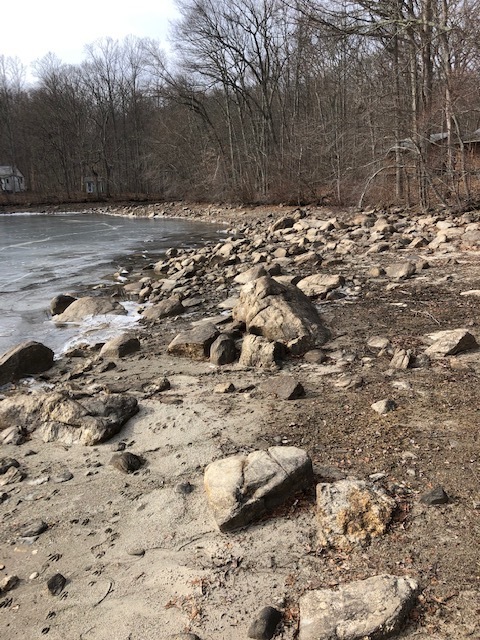 You can see that the water has been drawn down leaving a lot of sandy bottom and rocks exposed. In the foreground you can see the anchors for the White Raft sitting atop the raft, then the Pollywog Dock. Beyond that is the Gray Raft which is hard to make out, then the floating dock and finally the Main Dock. The rafts are floated into shore at the end of the summer to keep them safe during the winter. Picture #2 is looking the other way, toward Hungerford and the Icky Water Bridge. I hope you can make out Cabins 7 and 8 on the right side and a slight glimpse of the White Cottage and the Tool Shed in the background. The most interesting aspect of this picture is the rocks. They cover the shore. Aren’t we lucky that we swim in another area? Can you see the ice? I would guess the ice-fishermen and skaters will soon be out enjoying those winter sports. Thanks to all of you who have ‘spread the word’ to friends, relatives, neighbors and others who may be interested in an Asto Wamah experience. You are our best form of advertising and we appreciate all your efforts to introduce new people to CAW! Thank you.